The heat wave has ended and I have pulled out my jackets for this 85 degree weather, yes, I think it is mildly chilly out; I was raised in The South after all. The department stores have brought in boots and sweaters which made me think about what I needed to do about transitioning my summer yoga wardrobe into fall. There are things we in the fashion world like to call “staples” that are the backbone of your yoga wardrobe, like a basic pair of black pants and capris, an all-seasons jacket, a go-to tank, the perfect-fitting pair of fitness shorts and a core bra. Stemming from these basics should be similar styles in fashion colors, as well as other pieces that can transition from yoga class to the grocery store. These staple pieces are the things that will bring your summer wardrobe seamlessly into fall. Here are the pieces I LOVE and cannot live without when planning my transition this year. A good jacket is great for those southern fall days where it’s warm but the breeze can give you a chill. 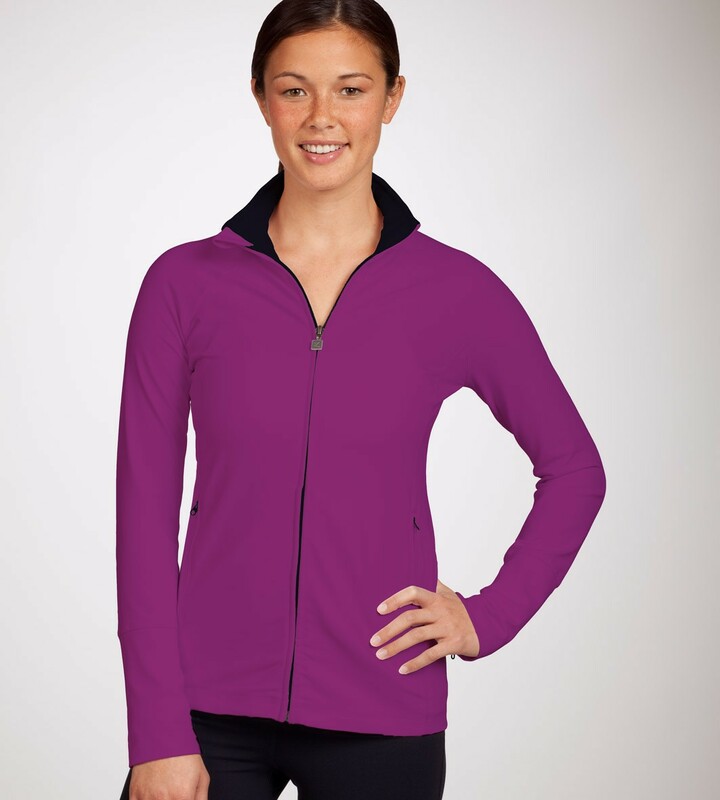 I have two go-to jackets, the Zobha Essential Jacket and the RESE Andrea jacket. I like these because they are a little longer and give me a little bum coverage. I can also cuff the sleeve from full length to a ¾ sleeve! Love that! Black is always the staple color, but fun fall fashion colors, like purple, are awesome too. I also love a great lightweight long sleeve for transitioning into fall. Atlanta gets those days that are fall-like but are a bit too hot for a jacket. Tees by Tina does a great line of one size, seamless shirts that I am obsessed with for fall. Made out of moisture wicking material, you can still work out in it, but you can also throw it on with your jeans. I’m currently sporting the red and navy nautical inspired ¾ sleeve tee with my Zobha ¾ navy leggings. To die for! Next, I have three words for you: FULL LENGTH LEGGING, preferably one without a seam on the outside. ROGIANI and Zobha make fantastic full length leggings that can double as a fashion legging because there is no seam. These are perfect for yoga or for a date, when worn underneath a sweater dress and some knee boots. Stirrup leggings are also making a comeback, so keep your eye out for a great pair, ROGIANI always features these for fall. The final thing I would suggest is a cover-up for leaving yoga, a jacket is great, but if you want to still look trendy, grab a PONCHO! Seriously, ponchos are back with a vengeance. Don’t want to wear a poncho? Then grab a dolman sleeve, 80s inspired, high-low top in a ribbed fabric. Sporty chic; what could be better! Hope these helped you figure out what to do over the next few weeks of weird weather! Have any suggestions? Comment or tweet me @YogaInHeels!